Orlando Magic power forward Glen Davis tries to defend as Sacramento's Rudy Gay drives to the basket. ORLANDO, Fla. — Even with the return of leading scorer Arron Afflalo, the Orlando Magic continued to struggle during what was supposed to be the least difficult portion of their six-game home stand. A double-digit lead late in the second quarter had vanished by early in the third quarter. 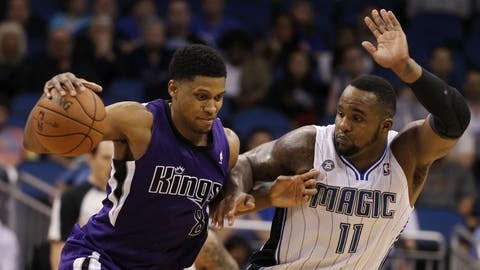 And the Magic never rebounded from a disastrous start to the fourth quarter in a 105-100 loss to the Sacramento Kings, who were playing their fourth road game in five nights. Afflalo, who had been too ill to play Wednesday night against the Utah Jazz, finished with 26 points and Tobias Harris had 21 in his second start in a row. But the Magic got next to nothing from Nikola Vucevic. His matchup with Kings center DeMarcus Cousins gave him fits, and Vucevic had only four points in 27 minutes before fouling out with 2:37 remaining. With Afflalo and Harris together in the starting lineup, rookie Victor Oladipo came off the bench for the first time since Nov. 16. Oladipo, who went 1-for-12 from the floor in the loss to the Jazz, had 12 points in 21 minutes. It was the Magic’s eighth different starting lineup in 27 games. The shakeup wasn’t enough the prevent the Magic from falling for the 10th time in their past 12 games. The Kings were coming off losses at Charlotte, Atlanta and Miami. They gave up 70 points in the paint to the Heat but looked like a different team defensively against the Magic after trailing 58-56 at halftime. Backup guard E’Twaun Moore was not available for the first time all season. Moore was accidentally kneed in the thigh during practice Thursday. Arron Afflalo scores 26 in his return, but the Magic can't slow down the hot-shooting Kings. The Kings outscored the Magic 18-4 to begin the fourth quarter. Marcus Thornton knocked down three 3-point field goals in a span of 1:30, the last of which gave the Kings a 93-81 lead. Thornton, Rudy Gay and Isaiah Thomas all connected three times from 3-point range for the Kings, who went 12 of 23 from that distance to 8 of 20 for the Magic. The Magic have gone 0-8 against teams from the Western Conference teams since defeating the Los Angeles Clippers on Nov. 6. They are also 0-13 in games where their opponent has scored 100 or more points. Monday night vs. New York, 7 p.m. (FOX Sports Florida).